Merry Christmas! Indeed, cold mornings and hot coffee for breakfast is in season! As a treat for the holidays, NomNom Club is giving away a Limited Edition Starbucks USB thumb drive simply by creating your Christmas Wishlist of 5, similar to Facebook’s Wishlist which is five. Simply create your wishlist consisting of 5 items and post it in your own blogs. In not less than 100 words, give it some story or narration for that creative touch. Place a link to NomNomClub.com and you’re good! The contest is open to anyone residing in the Philippines with a valid local address. 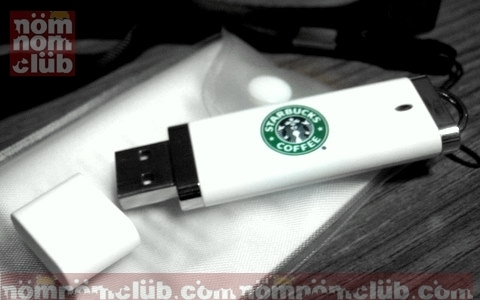 The Starbucks USB 512mb thumb drive will be couriered to the winner anywhere in the Philippines for free. The winner will be contacted through the email address he/she will use in sending the link. If you’re not much fond of the original Limited Edition Starbucks USB, you may want to participate in the Starbucks Planner 2010 contest; or better – join both! So what are you waiting for? 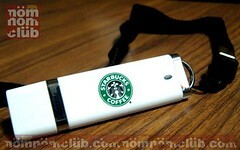 Create that short blog entry, link to NomNomClub.com, and send that email to join NomNomClub.com’s Christmas Wishlist Contest and get that Limited Edition Starbucks USB! Will I be lucky one? 😀 Here’s my entry! Invite to visit our site: http://kitchenmausph.blogspot.com/ THANKS. @Kasai – pls email this link (if you haven’t) to admin@NomNomClub.com as per mechanics indicated in the article above. Thanks! Just resend my entry. thanks! Can i post my wish list here instead? =) not much of a blogger.. i just want to join the contest. Hi L, Sorry but the mechanics indicate your wishlist story to reside in your blog. You may use the blog feature of Friendster if you have an account. Hi Ellen, yes got it. wow this is hard? 100 words lang? Ill try my best! Ehe. I’m not referring to your post. Maybe the one before me. Merlinda, I guess. I forgot to reply on her own comment. ^_^ I’m not a grammar police. LOL. Just trying to correct wrong interpretation if there is any. Cheers! Hi, I joined already and emailed my URL. My schedule has really been a little crazy and my laptop was stolen last week. I will try to respond to your email entries with confirmation receipts tonight or tomorrow. I hope you understand. I appreciate and thanks again for participating! oh my… I hope you can get lucky and win a freebie laptop somewhere. Thanks for the links. No worries, I understand. I would also go crazy if I lose my laptop! But, then again…I don’t have a laptop. tsk, tsk. it says in the mechanics to send the blog link to nomnom, but i dont know where to submit it. I have already sent the email to admin. Hi Liezl. I sent na Dec 23. You still didn’t receive any? hi! i haven’t received an email yet… was wondering if you already sent one to me? Oh boy! I like the prize..but I am not qualified to join (US resident). I have emailed my wishlist entry as well. Hope I am in and looking forward to updates. A prosperous new year to nomnomclub.com. sent an email with my entry 🙂 hoping for good news!!! Updates updates. LOL. Happy New Year! I just submitted my entry. Hope you received it.